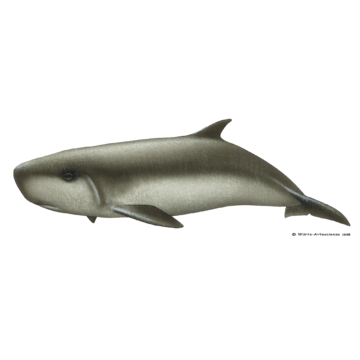 Dwarf sperm whales are smaller than the other Kogia species. The adults are about 2.7m long and weigh up to 270kg. Length and weight at birth are about 1m and 14kg, respectively. There are 7-12 pairs of extremely sharp, fang-like teeth in the lower jaw; sometimes up to three pairs of teeth are present in the upper jaw as well. Life span is uncertain, but does not appear to be long; the oldest known individual was 22years old. Coloration of the adults is dark bluish-grey to blackish-brown dorsally and lighter below. The belly often has a pinkish tone. On the side of the head between the eye and the flipper there is often a C-shape, light coloured mark referred to as a “false gill”. A ring of dark colour surrounds each eye. The body is robust, with a rather triangular or squarish head profile and a narrow lower jaw. The dorsal fin is large, falcate, and set near the middle of the back. The blowhole is positioned forwardly on the head. Kogia species feed mostly on mid and deep water cephalopods (squid, octopus, cuttlefish) but also consume fish and occasionally crustaceans (shrimps and crabs). Very little is known about the social structure of these animals as groups of up to 10 individuals of both sexes and various ages have been reported, strandings usually involve single individuals. Dwarf sperm whales reach sexual maturity at about 2m in length. Gestation has been cited varying between 9-11 months. Dwarf sperm whales are often seen spending considerable time lying motionless at the surface with the back of the head exposed and the tail hanging down. When surfacing, they rise slowly, produce an inconspicuous blow, and dive without showing the flukes. Dive durations of nearly 18min have been recorded. The distribution of this species is poorly known from observations at sea; however they frequently strand in beaches or coastlines and evidences of strandings show that dwarf sperm whales seem to have a more tropical, warm water distribution compared to pygmy sperm whales (Kogia breviceps). There is no evidence for migration in this species. It can be very difficult to distinguish between the two Kogia at sea. Dwarf sperm whales, however, are smaller and the dorsal fin is usually more prominent and erect. The dorsal fin is also set more toward the middle of the back. The position of the blowhole, if seen, might also help, as it’s set more forwardly on dwarf sperm whales. The only sighting we had of this species, so far, occurred in July 2013.